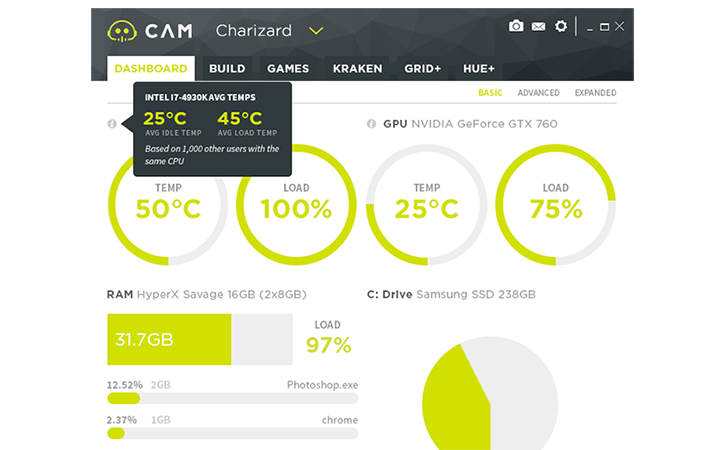 NZXT is best known for its PC hardware components, but one of the most intriguing products on show at the company's CES 2016 suite is an updated software utility dubbed CAM 3.0. The hardware monitoring tool, demonstrated in the above video, is attempting to be an all-in-one replacement for the likes of CPU-Z, GPU-Z, RealTemp and others, and at first glance it appears to be a useful alternative. Presentation is nice and clean throughout, and CAM 3.0 includes a few nifty features. One example is the ability to source data from the cloud to compare your system stats with others, making it easy, in theory, to see if your CPU temperature is in line with the average. CAM 3.0 will also record FPS, with the option of an in-game overlay, and we're informed an Overclocking tab is in the works for a future release. The utility is available as a free download from camwebapp.com, so give it a go and share your feedback using the comments facility below. I tried CAM before when it first came out as I was hoping it could replace all the other programs that I used to monitor my pc with but at that time it would hardly monitor anything so stopped using it. Might give it another try.